Castle came out and cut a promo about having won the title in the Hammerstein. Then he spoke about his Best in the World match against Cody and Scurll. He went so far as to say he could defeat werewolf. Taven came out stopped the pageantry, complaint for the Kingdom Conspiracy and that he is the rightful champion and that he’s Matt Taven. Vinny Marseglia and TK O’Ryan attacked from behind, prompting Castle to fling boys st them repeatedly until he was able to peacefully peacock pose. Jonathan Gresham vs. Kenny King defeated Jonathan Gresham after hitting the Royal Flush in a really fun wrestling match. Josh Woods defeated Facade after hitting a fireman’s carry slam. Woods called out Shane Taylor who teased wrestling him on the spot, but ultimately left. 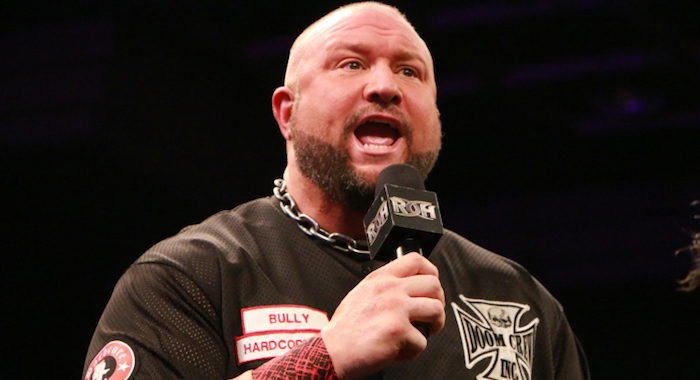 Bully Ray defeated Cheeseburger with a big boot. Colt Cabana came down to the ring to stop Ray from beating on Todd Sinclair and cheered Cheeseburger on for the win until BJ Whitmer ordered him to the baPost-match, he came back down to chase Ray off. Kelly Klein defeated Jenny Rose after hitting the End of the Match. LSG was able to duck the move and roll him up for the pinfall victory. Silas Young, The Punchers (BCB & Milonas) in next. LSG hit a 450 for the pin to stay alive. Alex Shelley was taken to the back with an injury during the match and taken to the back,King, Chuck Taylor and Eli Isom came out next. Daniels went for an Angels wings, but Isom reversed it into a pinning bridge for the upset victory. Future of Honor MatchJ-Rocc vs Afa Jr. defeated J-Rocc via pinfall after a big splash off the top. As Guerrero went for a what seemed like the finish, Marseglia’s balloons rose and distracted him- allowing Taven to hit Climax for the win. Post match Taven gloated, prompting Guerrero to say that he was coming back with help to challenge for the 6-mna titles. Cody defeated Titan when Cody eventually just ripped Titan’s mask, distracting him enough to win via small package. Chuckie T vs Jay Lethal defeated Chuckie T when T went for an Awful Waffle, but Lethal countered and hit the Lethal Injection for the win. The Hung Bucks (Adam Page & The Young Bucks) defeated Punishment & The Briscoes Crazy fun match, Matt avoided the Doomsday Device with a victory roll to win the match. Cody came out afterwards to the rescue his friends and the Briscoes jawed at the Bucks as they left.